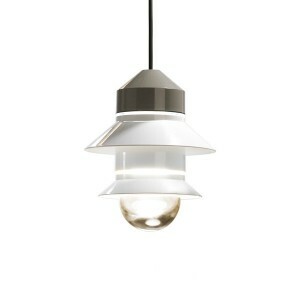 Pendant lamp in glass and polycarbonate. Lamp design Marset. Suspension lamp with diffuser in glass blowing and pressing, attached to a structure of grey polycarbonate with screens of various colors. Protection IP 67. Bulb E27 FBA 15W and E27 LED Standard 8W-ready. Inspired by the lights of fishing boats, this collection of customizable outside allows to create multiple compositions. The user chooses the number of aros-pantalla on the diffuser, your order, position and orientation of the visors. This Combinatorial game is derived a rich range of direct or reflected light. The Santorini collection can be suspended from the ceiling, individually or in group, or go to Hung wreath-shaped. It works also as a wall or floor lamp, lamp with accessories brackets where knotted informally. 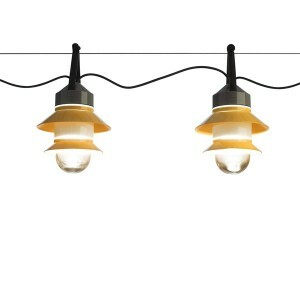 Santorini lamp variants are multiplied with the choice of the color of the rings, produced in white, grey and mustard. IMPORTANT for version suspension, wreath, wall or floor see brackets: accessory rosette (A654-008), accessory rosette IP65 (A654-007), accessory Garland (A654-004), accessory (A654-005) wall bracket, bracket wall IP65 (A654-006) and accessory structure lamp (A654-009).